Peta Murgatroyd is fighting back against post-baby body expectations. The "Dancing With the Stars" pro recently gave birth to her first child, son Shai Aleksander, with fiancé and fellow DWTS pro Maksim Chmerkovskiy. 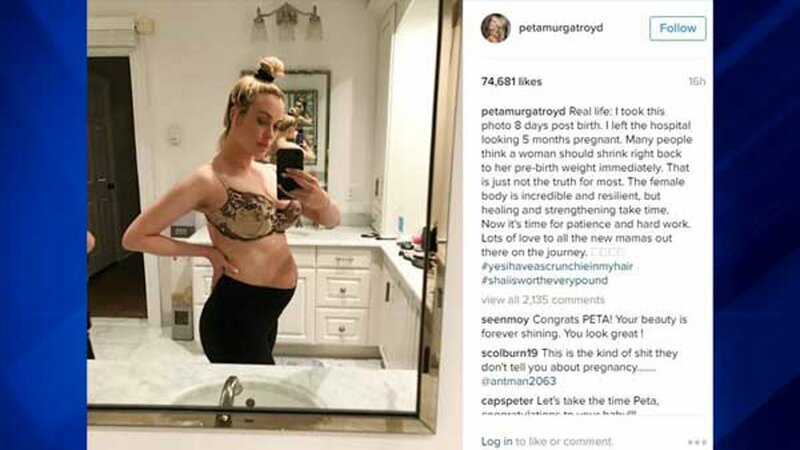 To show that not all women snap back to their pre-baby weight and shape, Murgatroyd posted a picture of herself from eight days after giving birth, writing in the caption: "I left the hospital looking 5 months pregnant." "Many people think a woman should shrink right back to her pre-birth weight immediately," she wrote. "That is just not the truth for most. The female body is incredible and resilient, but healing and strengthening take time." Murgatroyd is known to have one of the most in-shape bodies on her dance reality show. She also offered encouragement to other women. "Now it's time for patience and hard work," she wrote. "Lots of love to all the new mamas out there on the journey." One picture Murgatroyd has not shared yet is of the new baby. She and Chmerkovskiy have said they decided to wait before sharing images of their son. The couple announced their engagement in December 2015.